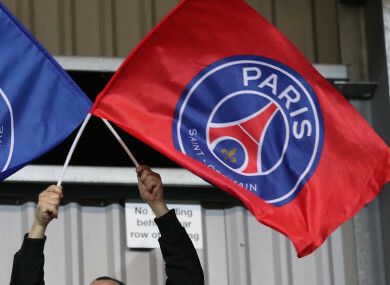 THE METROPOLITAN POLICE have confirmed that one Paris Saint-Germain fan has been arrested in connection with incidents before Thursday’s Women’s Champions League game against Chelsea. PSG travelled to London for the first leg of their quarter final match against the Blues, with the return match scheduled for 27 March. The build-up to the game at Kingsmeadow, however, was marred by reports of criminal damage and disorder levelled against a group of the French team’s fans. Those reports were later confirmed by police sources, who revealed that supporters had carried weapons to the match on board a coach. “Weapons, including knives and knuckledusters, were recovered along with class A drugs,” a statement released by the Met explained. The coach is understood to have travelled from Paris to London overnight carrying the fans, 50 of whom were denied entry to the stadium on Thursday evening. Reports of vandalism at Kingsmeadow emerged as early as 8pm GMT, including a broken door and pro-PSG graffiti daubed on the walls. The fans are believed to be part of a PSG ultras group known for their violent behaviour, according to the BBC. The group has already been banned from attending first-team and youth matches of the Ligue 1 side, but no such prohibition is yet in force for the club’s women’s team. Chelsea and PSG’s clash suffered no delay despite the incidents, with the Blues taking the lead through Hannah Blundell deep into the second half before Erin Cuthbert doubled their advantage in the 88th minute to secure a 2-0 win for Chelsea. Email “Police find weapons and class A drugs as 50 PSG fans denied entry to Chelsea women's game”. Feedback on “Police find weapons and class A drugs as 50 PSG fans denied entry to Chelsea women's game”.